It is sometimes used to treat Zollinger Ellison syndrome, a rare illness caused by a tumor in the gut or pancreas. Adults, pregnant and breastfeeding woman can take this medication. Children and even babies can take Omeprazole if it’s prescribed by a doctor. 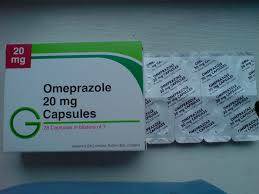 Omeprazole is a proton pump inhibitor. It helps to decrease the amount of acid produced by the stomach. This drug blocks the proton pump cells in the stomach to prevent it from releasing the acids. Use Omeprazole as a short-term treatment for gastric and duodenal ulcer and GERD. Use it as a long-term treatment for erosive esophagitis. Take this medication exactly as directed by your physician. Take the drug in the morning. For severe illness, take it twice a day in the morning and in the evening. Stomach ulcers due to H. pylori bacteria: Take 20mg every 12 hours for 10 days along with an antibiotic of 1000mg every 12 hours for 10 to 14 days. GERD: For an adult, take 20mg a day for 4 weeks. The recommended dose for children weighing 5 to 10 kg is 5 mg once a day. Those who weight 10 to 20 kg must take omeprazole 10mg once a day. Erosive Esophagitis: Take 20mg every day for 4 to 8 weeks. For maintenance, take 20 mg daily for 1 year. This drug is safe for pregnant and breastfeeding women. Do not take this drug for more than 2 weeks if you are using this without your doctor’s prescription. Your risk of having an abnormal growth of tissue in the upper part of the stomach may increase if you have been using this medication for more than a year.